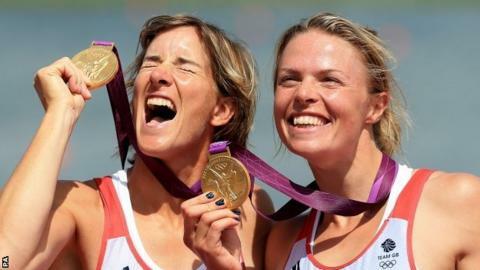 British rower Katherine Grainger says she and partner Anna Watkins can go even faster if they were to defend their Olympic title at Rio 2016. Grainger is having a year out in which she will finish her PhD and work with BBC TV before deciding on her future. "The double is one of those rare boats you get in your career, if you're lucky, that will do almost anything," she told BBC Sport. "We took it incredibly far in London, but I think we can go further with it." Grainger, 37, and Watkins, 30, arrived at the London Olympics as overwhelming favourites having remained unbeaten since forming a partnership in 2010. However, the pressure was on Grainger, who had won silver at each of the previous three Olympics. But after a blistering start the duo were never challenged and won by more than a boat length to secure their 23rd consecutive victory. "We had this wonderful partnership and we've got this strong friendship," continued Grainger. "We really enjoy each other's company and that made training so much easier. I would love to row with her again." Following the Games, Grainger, who was nominated for the BBC Sports Personality of the Year award in 2012, was inundated with the various opportunities that present themselves to Olympic champions. But post-Christmas, the focus returned to the PhD in criminal law which had taken a back seat during the four-year cycle to London. "My PhD has never been a priority but the deadline is looming and it's really important to me that I get it done - and I get it done well," she added. "The time between the Olympics and Christmas was busy and it took up more of my time than I thought. "So from January through until May, I'm focusing on it. That means I'll be out of a boat until May and that's not enough time for me to reach the standard I want to be at before the World Championships [in August]. "You gain respect in the squad by turning up to training every day and I was conscious that I wouldn't be doing that so I didn't feel I deserved my place." Grainger says it will be "safer" to make a decision on her future once she has finished her PhD. "Just talking about the Olympics makes me feel inspired again - and there's a part of me that wants to go back to rowing and take on that challenge one more time," she said. "But then I swing to the other side and the other opportunities that are available to me. So I think it will be safer to make a decision once my PhD is done." Grainger will join BBC Sport's John Inverdale at the women's boat race at Henley on 24 March to present highlights of the first World Cup of the season in Sydney. She will then continue to work with the team throughout the season. "I've spent 15 years as an athlete being interviewed so it'll be different being on the other side," she said. Highlights of the Sydney World Cup will be on BBC Two on 24 March at 1600 GMT.